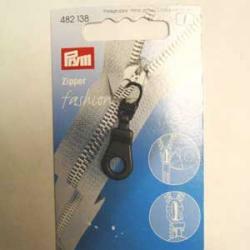 Zipper puller that you can attach to zipper lock. You can replace your old puller with this or you can use this to render a missing puller. Attaching with a locking mechanism that can be re-opened but stays shut when wanted. You can also remove the puller from this locking mechanism and use the mechanism with your own puller or cording. Applicable with 6mm or smaller zippers.